Monster Hunter: World PlayStation®4 will feature Horizon Zero Dawn content! 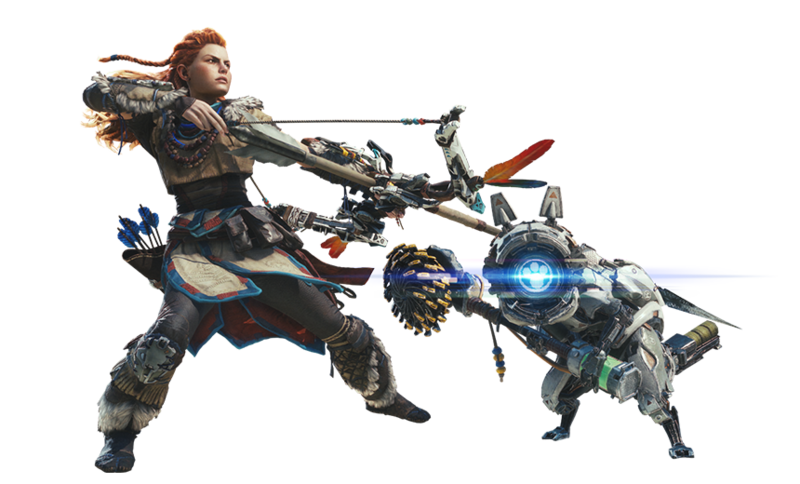 Horizon Zero Dawn's young machine hunter Aloy comes to life in Monster Hunter: World for PS4, with Aloy's bow and full armor set and Palico armor that can make your Palico look like a machine from Horizon. "Horizon Zero Dawn™ ©2017 Sony Interactive Entertainment Europe. Developed by Guerrilla. "Horizon Zero Dawn" is a trademark of Sony Interactive Entertainment Europe. All rights reserved." The items you receive for completing the event quest "The Heart of the Nora" can be used to forge the following items! Full armor set: "Aloy γ"
- Full armor sets cannot be equipped in conjunction with other armor parts. - Unlike layered armor, which only changes appearances, full armor sets activate a predetermined set of skills, and can even be upgraded at the Smithy. - A player character equipped with Aloy's full armor set will resemble Aloy even if it's a male character. The items you receive for completing the event quest "The Proving" can be used to forge the following items! Full armor set, "Aloy α"
The items you receive for completing the event quest "Lessons of the Wild" can be used to forge the following items! Palico weapon, "Felyne Watcher Grinder"
Palico full armor set, "Watcher"